Marconi had first done it back in 1901. For amateurs, crossing the Atlantic was the next natural challenge—they had been thinking about it since before the war. Many in the scientific community were skeptical that such a feat could possibly be achieved at such a short wavelength as 200 meters, especially with power as low as one kilowatt. An early rumor that American signals had been received in Europe appeared in the press in December 1920.1 The new record, the story went, may have been set on 6 October when signals from 2QR, a 100-watt station operated by brothers Harold and Hugh Robinson of Keyport, New Jersey, were reportedly received by George Benzie and James Miller in Aberdeen, Scotland, who claimed they had heard “phonograph musical selections.” But after a year-long investigation that was still going on during both sets of transatlantic tests, a committee of the R.C.A. concluded that it had not, in fact, occurred.2 The group did not question the Robinsons’ motives, believing they had given Benzie’s letter, in which he claimed reception, to the press in good faith. As it turned out, 2QR was not transmitting when Benzie claimed to have heard it, and the Robinsons agreed. In February 1921 the first, though unsuccessful, transatlantic attempt involved 25 US stations transmitting and over 250 British amateurs enrolled as receiving entrants.3 The test had been originally proposed and planned in 1920 by M. B. Sleeper, the radio editor of Everyday Engineering. But after the magazine ceased publication later that year, Sleeper asked ARRL to take over the operation. With little time left to fully reconsider how to run it, the ARRL Operating Department stepped in. Coded messages (which they called “arbitrary signals”) were assigned to the transmitting stations, and logged reception reports were compared for accuracy. Although many signals were heard but not copied, none could be conclusively shown to represent a completed reception. In the twenty years since Marconi’s crossing, the criteria for what constituted a valid reception had become much more stringent—a single letter ‘S’ would no longer suffice. After all, in Marconi’s case, his station had been easy to identify since it was the only one on the air. While gratefully acknowledging the cooperation and enthusiasm of British hams, ARRL secretary Kenneth Warner attributed the failure to their outdated receiving equipment and an understandable lack of experience in DX work, both of which the Americans had developed only after “years of patient struggle.” With new equipment and expertise he was confident of success next time. “We would bet our new spring hat that if a good U.S. amateur with [a more modern] set and an Armstrong Super could be sent to England, reception of U.S. amateurs would straightway become commonplace,” wrote Warner. The bet would eagerly be taken up and doubled down. After considering other deficiencies that might have contributed to failure in the first test, the organizers developed improved procedures. A second attempt would take place on the evenings of 8 through 17 December.4 The new plan would give “each transmitter a fair chance to accomplish this almost unbelievable feat.” To be eligible to participate in the test a station would first have to be shown capable of reaching 1,000 miles by doing so in an over-land qualifying test in November. Phillip R. Coursey, assistant editor of The Radio Review in London and operator of 2JK (British), was in charge of all receiving operations and would determine the winners after reports had been received. Coursey had also officiated in the previous unsuccessful tests in February. The announcement in QST referred to the event as a “contest”—maybe the first DX contest, albeit one in which all contacts were one-way only. A message arrived at the convention from US Secretary of Commerce Herbert Hoover. The man who would be elected president seven years later referred to his department as the “Patron Saint of Amateur Wireless Operators,” and called amateur radio “a very important movement.” The message arrived via radiogram, of course. An evening session featured many well known speakers including DeForest, Armstrong, A. H. Taylor, L.M. Clausing, and R F. Gowen, along with Frank Conrad of 8XK radiotelephone fame. CW was the hottest topic of the technical sessions and a “CW Night” was devoted to that mode entirely. Professor C. M. Jansky6 of the University of Minnesota presented a paper on the superiority of CW to spark by comparing operating experiences. Not everyone had been convinced, however, and Warner read two letters from “Speedo Vermilya, 1ZE” about spark’s superiority. The debate continued; the only consensus was that the coming season of on-air work would likely decide the matter. The ARRL Board of Direction met to discuss the transatlantic test and decided unanimously to appropriate funds to send a US ham to England to ensure success. Paul Forman Godley grew up in Kansas and spent his late teen years working as a telegraph operator for railroads and other companies. Enthralled with wireless at a young age, he read whatever material he could find about it, such as articles in Scientific American. In 1908 at age 19 he managed at last to become involved in wireless at a commercial firm in Chicago. Impressed with his enthusiasm and expertise, his superiors put him in charge of the United Wireless station in Grand Rapids before he turned 20. 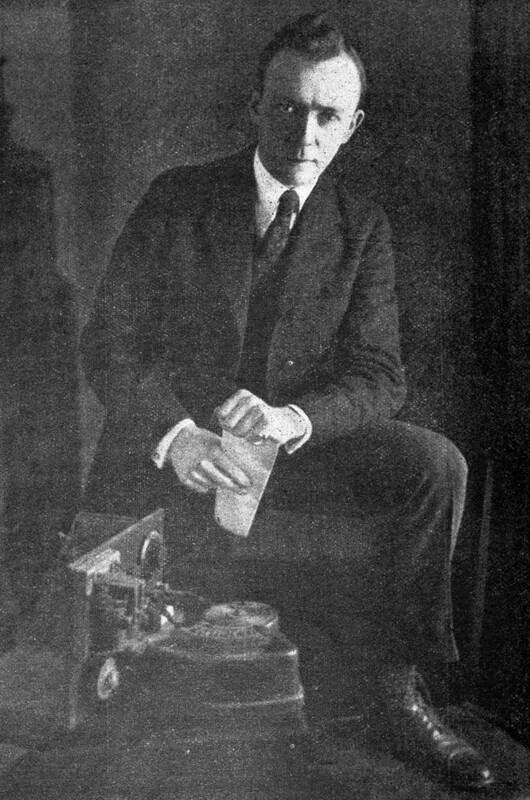 Over the next four years he found himself in a whirlwind of wireless work: a student at the University of Illinois, installing equipment and designing courses on wireless in Texas, on assignment as “wire chief” of the Post Office in New York, and on the Amazon River helping to develop a radio service for the Brazilian government. Finally settling in New Jersey in the summer of 1914, he built a station, 2ZE, broke all distance records with it, and designed a new regenerative receiver that became very popular among amateurs. Presenting his designs to the R.C.A., and publishing them in QST, he was widely credited with being the first to adapt the Armstrong regenerative circuit to shortwave amateur use. As an engineer at the Adams-Morgan Company he developed their Paragon line of receivers based on this design, and later at the Marconi Company he designed military receiving equipment for use during the war. In 1918 he married, started a family, and later started his own company in Montclair. Godley would be sent specifically to supplement the British efforts with American expertise using American apparatus.8 Judged by the ARRL board as “America’s best authority and best operator in short wave receiving,” he would sail to England aboard the Aquitania on 15 November to prepare for the December operation. Meanwhile, he would be building and selecting the best equipment he could find to cover the shortwaves. Perhaps the most important change from the February attempt was that in addition to scheduled operations of the more powerful, qualifying stations, everyone else was invited to join in too. The organizers explicitly wanted this test to be a “free for all in which everybody can participate.” QST reminded readers that the proper direction to favor was northeast since signals followed the great circle route. Therefore those on the Atlantic coast would not necessarily have an advantage. The test would consist of ten nights of six-hour sessions, from 7 thorugh 16 December , and run from 7:00 p.m. to 1:00 a.m. Eastern Time in the US. The “free for all” session would run from 7:00 until 9:30, when stations could transmit according to time slots assigned in fifteen-minute intervals assigned by district. Qualifying stations would then transmit for the second interval beginning at 9:30, according to a schedule of fifteen-minute periods, the sequence of which would be rotated each night. Two or three stations shared each time slot and would transmit simultaneously. Each of the qualifying stations would transmit five-letter coded messages, called “secret cipher combinations,” that were sealed in envelopes not to be opened until the tests began. The identities of the 27 stations were likewise kept secret, and included 20 CW and 7 spark transmitters. Among them were 1AW (Maxim), 1ZE (Vermilya), 6XH (Stanford University) and 9ZN (Mathews). ARRL Traffic Manager Schnell would send the schedule and station list to only Coursey, and seal his own copy in the safe at ARRL Headquarters. Godley, who would report through Coursey just as the other listeners would, only knew the free-for-all schedule as did the general public. Coursey would give him and all the other listeners information about schedules and wavelengths, but would keep the station identities and cipher groups secret. Public interest in the test ran high in Europe, especially in the Netherlands, France, and Britain, where details were published in their national radio journals. A Burndept III Ultra receiver would be awarded by Burnham & Co. of England, as announced by Mr. W. W. Burnham, “one of England’s leading amateurs.”9 The prize would go “to the A.R.R.L. member whose signals rank first in the reception in the British Isles,” though it was unclear how the ranking would be judged. With Duo-Lateral coil 1500 in the secondary, shunted by a 43 plate (.001mfd.) condenser, WII tunes in at about 50 degrees on the 180 degree scale, and MUU should tune in at not over 53 degrees. The filament and B battery are of course adjusted in the usual manner; then the secondary condenser is adjusted to approximately the figures above indicated. The plate coil is gradually brought closer to the secondary until the tube oscillates which is indicated by a “thud” in the phones. With the primary coil about 2 to 2-1/2 inches from the secondary, slowly vary the primary condenser until the set is “balanced out.” After signals are picked up they can be brought in clearer and stronger by further adjustment of primary coupling, accompanied by slight changes in primary condenser. After that a slow loosening of the plate coupling will almost always give additional amplification. Today this seems rather like running through an alignment procedure each time you tune your receiver to a new frequency. 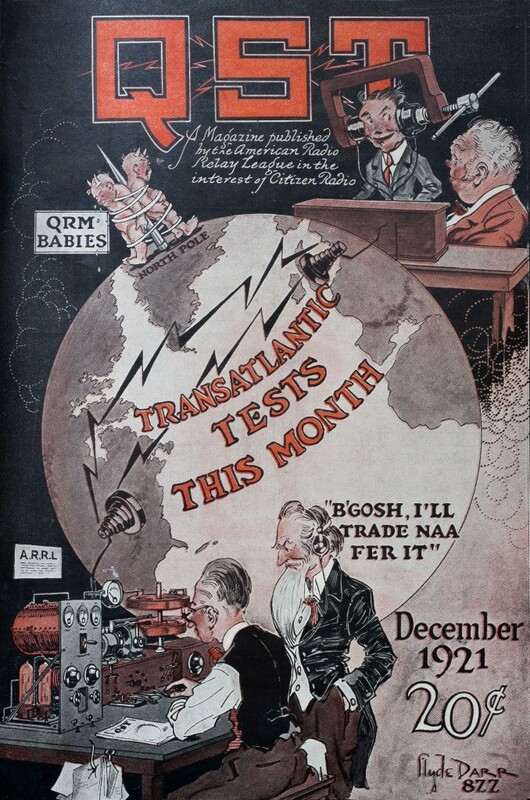 The December 1921 QST cover drawing by 8ZZ announced “Transatlantic Tests This Month” in large type across a globe where lightning bolts linked North America to England and “QRM Babies” were lashed tightly to the north pole spike where they presumably could do no harm. In America, a ham sits at his station keying his transmitter with The Old Man looking on. In England a ham listens intently through headphones tightened firmly in place with a C-clamp over his head. Another gentleman looks on, perhaps the British equivalent of T.O.M., or perhaps Mr. Burnham. Inside, a photograph captured Schnell and Warner on board the Aquitania seeing Paul Godley off on his voyage to England. A send-off dinner had been held for him in New York the night before departure, attended by luminaries including Maxim, Hebert, Camp, Stewart, Service, Goette, E. H. Armstrong, J. Andrew White, P.H. Boucheron, G. H. Burghard, and W. S. Smith. Among the testimonials, Armstrong was quoted as saying, “I’ll stake my scientific reputation on Paul Godley.”10 It’s hard to imagine a stronger endorsement. By coincidence, Dr. Harold H. Beverage, inventor of the wave antenna,12 also happened to be aboard Aquitania for this voyage, something neither Godley nor anyone else in the crowd had known beforehand. Recognizing the well-known radio experimenter at the railing a short distance from Godley, the group on the dock let him know via this hand-Morse. Godley immediately went over to introduce himself, the two having never before met in person. Beverage, who had noticed the gesturing too, signaled “OK” to the crowd as he shook hands with Godley—a striking metaphor for what was to come. 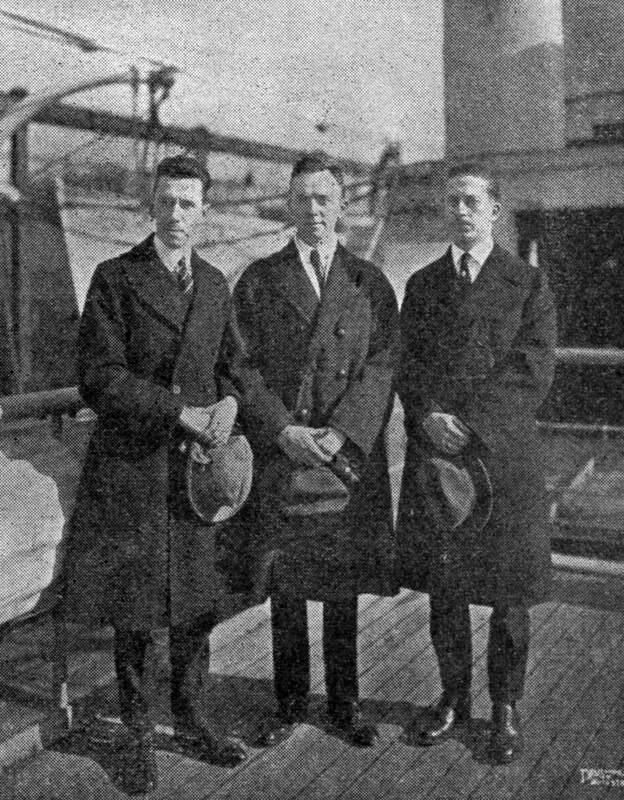 Warner, Godley, and Schnell aboard the Aquitania just before it sailed for England. Godley carried with him information about the final schedules and the all-important cipher combinations, messages that were known ahead of time only to ARRL Traffic Manager Schnell, in a sealed packet that Coursey would open and become the only person to know them on the receiving side of the Atlantic. In addition to the nightly reports transmitted by MUU, Beverage’s station, 2BML, manned by operators from RCA’s Long Island receiving station in Riverhead, New York, would retransmit the reports on 200-meter CW. ARRL gratefully acknowledged the help of both companies, Marconi and RCA. Godley’s own twenty-page account of the entire operation, including much of his minute-by-minute log, appeared in February 1922 QST and makes interesting reading. To Paul F. Godley, SS Aquitania via WBF. Bon Voyage! The entire radio world is pulling for you! He replied, “Confidence increases as distance squared. Broadcast my heartfelt appreciation.” Heartened by the well-wishers’ messages, he resolved to “get signals or bust!” Keeping in mind the skepticism and what he termed “veiled interest” from the engineering community of which he was a member, and feeling that no ham in Britain believed the test would succeed, Paul Godley was eager to prove them all wrong.